Maybe we put too much hope into Serena Williams and her latest comeback. Maybe we saw how Williams breezed through her first three matches of the French Open, beating two top-20 opponents along the way while dropping only one set, and thought she could actually win a Grand Slam tournament in just her third tournament back from having a baby. Less than an hour before Williams was to take the court against Maria Sharapova with a spot in the quarterfinals at stake, the 23-time Grand Slam singles champion pulled out of the highly anticipated match with a pectoral muscle injury. And that’s how Williams’ first Grand Slam since winning the 2017 Australian Open came to a halt, not in a blaze of glory but a news conference where Williams appeared to be extremely disappointed — which pretty much sums up the mood of every tennis follower looking forward to a Monday morning grudge match. Just like that we were left with no more catsuits. No more French Open dominance. And a missed opportunity to see whether Williams could continue her winning streak against Sharapova, an opponent she had beaten 18 straight times. This is a match we wanted to see. Especially after Williams was asked on Saturday about their “rivalry” (as much as something can be called a rivalry when one opponent beats another in 19 of 22 career matches) during a news conference. 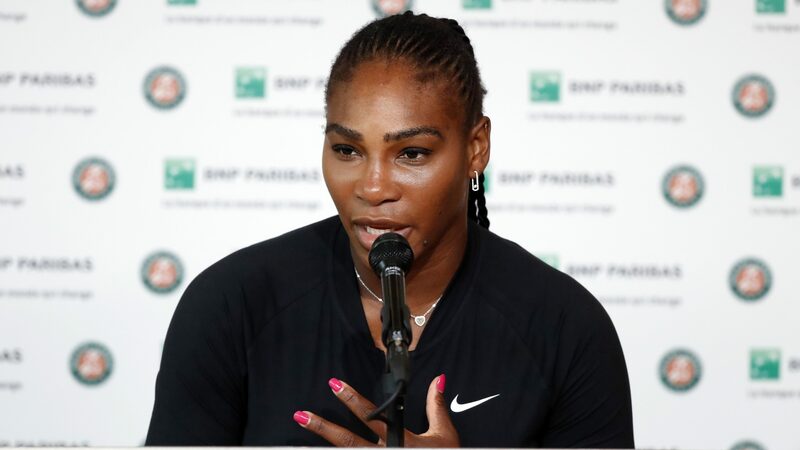 Serena Williams speaks during a news conference after pulling out of her match against Maria Sharapova during the French Open tennis tournament at Roland Garros in Paris on June 4. Williams’ response about the book during her weekend news conference: “I was surprised. … I didn’t expect to be reading a book about me, that wasn’t necessarily true. There is nothing about Sharapova that intimidates Williams. She has taken great joy in beating Sharapova in head-to-head matches, which might have led to a lot of head-scratching with Monday’s French Open departure. Critics will say Williams pulled out of a match that she couldn’t win. Doubters will say Williams, with wins over the Nos. 19 and 11 players in the world, could not beat Sharapova, the 30th-ranked player in the world who hasn’t dropped a set in the French Open since her first match. And haters will say Williams didn’t want to give Sharapova the satisfaction of ending a losing streak that dates to the WTA championships in 2004. Serena Williams doesn’t want to lose to Maria Sharapova ever again taking it to the point of withdrawing today, as she knew Sharapova had all in her favour to win this one. Serena Williams was afraid of losing to Maria Sharapova .. The bottom line is that Williams, despite playing at a high level over the last week, likely wasn’t ready to win a Grand Slam at this moment. Even though her coach, Patrick Mouratoglou, told WTATennis.com the week before the French Open began that Williams would be ready for the tournament with the expectation “to win it,” doing so would have been difficult in a tournament where, as of Monday morning, six of the top 15 players in the world remained, including No. 1 Simona Halep, No. 10 Sloane Stephens and No. 13 Madison Keys. As we said on the eve of the tournament: Don’t worry, Williams will get there. She’s too good not to win majors and too competitive to let the record of all-time Grand Slam wins by a women’s tennis player elude her (she’s two shy of the 25 that would put her in the top spot). The only concern now is whether this pec injury, which Williams first felt during her third-round singles win over Julia Goerges, will affect her playing at Wimbledon next month. Hope the news on Tuesday is good. Hope the injury isn’t that serious and this injury is a mere bump in the road in her comeback. Let’s hope that she keeps fighting and that this is just the beginning of bigger and better days to come. Williams is too important a figure for women’s tennis to be without for another extended period of time.